There is a wide range of different dog leashes, so we’ve decided to write this guide to help you to choose a leash that meets your needs. Material, length, width, type of a snap hook and functionality are the main factors which you should take into consideration when buying a dog leash. We don’t add to this list the price factor because all our leashes are cheaper than any other leash of similar quality in the world if you take into consideration such index as quality vs price. There are different types of leashes: nylon, leather and chain ones. Nylon leashes are a perfect low budget solution. Their main feature is water resistance, so you can use them no matter what the weather is outside. Nylon leashes are also great for using in high humidity areas. You can use leather leashes in any weather as well but please make sure to apply leather conditioner from time to time to keep their initial look and prolong their service time. Nylon leashes do not stretch at all while leather leashes have a natural stretch ratio which should be minimal for good quality material. Also, leather items look nicer and always indicate the social status of an owner. Both materials are very strong, so any leash will be great for handling large and powerful dogs. 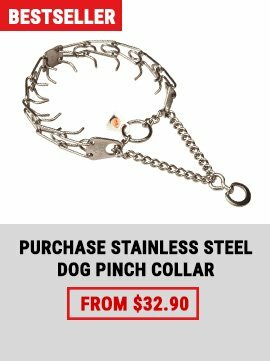 In case your dog has a bad habit to bite his leash or chew it you should consider buying a chain leash which might discourage your dog from chewing it. 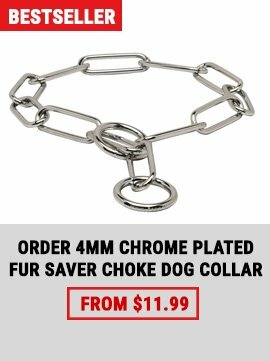 When you purchase a chain leash, make sure that your canine is within your eyesight because he can hurt his teeth. The shortest leashes are 10 inch long pull tabs. They are used for taking a dog out of a car, for better control and off leash training. If you want such a training item, choose this Extra Durable Leather Pull Tab Dog Leash. A longer leash gives your dog more freedom during walks but offers you less control. 3-4 ft long leash is the best for walking your canine in the park or for training. Pay attention to this Braided Leather Dog Leash with Brass Hardware. If you want to involve your pet into tracking activity, choose the longest leash (around 27-33 ft). You can probably use a longer leash also for walking if you live in an area with a lot of space or when walking in the field. Check this Nylon Dog Leash for Tracking and Training. The width of a leash will affect its weight and strength. We produce leather leashes for small dogs which are 1/2 inch wide, such as this Stitched Handcrafted Leather Dog Leash. They are great for dog shows and for obedient dogs. The majority of leather and nylon leashes are 3/4 inch wide; they are meant for large and powerful canines. Check this Multifunctional Leather Dog Leash. Of course, wider leashes are made with bigger snap hooks which make the items stronger and heavier. It is very important to use a reliable snap hook as it the link that connects a leash and your dog. A snap hook should be strong, smooth and easy to open/close and should have a mechanism which will prevent accidental unclasping. There are hundreds of snap hooks. Some of them only look impressive but will not hold on for a long time, unlike the snap hooks we use for the manufacturing of our high quality dog gear. These are brass traditional snap hooks, stainless steel snap hooks and quick release Herm Sprenger snap hooks. The main advantage of a quick release snap hook is that it will lock harder while pulling and applying pressure on it. You don't have to pull your dog to open this snap hook. All you have to do to let your pet off the leash is to press two fingers on it. This kind of snap hook is widely used by K9 police and military forces because a dog can be unleashed in few seconds in a critical situation. Be sure it will be comfortable to use for everyone. You will like this special police snap hook as well. With its help, you can quickly release your excited dog to run free in the park. For example, you are welcome to check this Extra Strong Leather Dog Leash with Scissor-Type Snap Hook. Usually, this is the only factor you should pay attention to choosing a dog leash. Dog training. Consider buying a 6ft long and 3/4 wide leash. It should be also super durable to withstand excessive overload. Extra functionality can be achieved by ordering a floating ring on the handle. You can use for training purposes this Perfect Quality Dog Leash Made of Leather. Tracking. Choose a long leash around 30 ft long such as this Best Tracking Dog Leash . If you doubt what length you need, consult your trainer. City walking. A strong 2-3 ft leash will be the best for daily use. It should have a comfy handle not to rub your palms. Choose for daily walking this Braided Leather Dog Leash with Additional Handle. Dog show. We have special leashes for showing off your dog. They are thin, elegant and don’t distract attention from a doggy. You should try this Dog Show Leash to see its beneficial features. Police or military service. Check this Multipurpose Police Dog Leash. Such kind of leashes are good not only for police working dogs but also for ordinary pets. They can be used for many dog activities, including daily walking and training. Walking several pets. 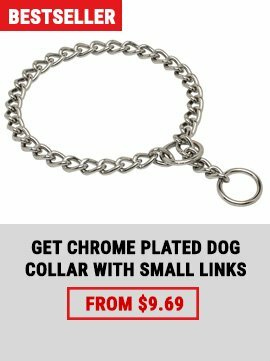 There are so-called 'couplers', the leashes that are meant for walking of two or three dogs at the same time, such as this Chrome Plated Dog Coupler for Walking Several Pets. Browse our entire collection of Top Grade Multipurpose Dog Leashes to choose a leash you enjoy more. 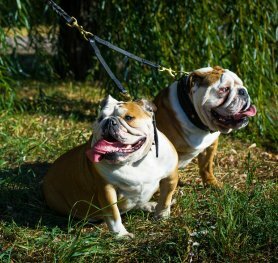 If you have any further questions or feel that after reading this guide you still need help, please do not hesitate to contact us for additional assistance or custom dog leash request.